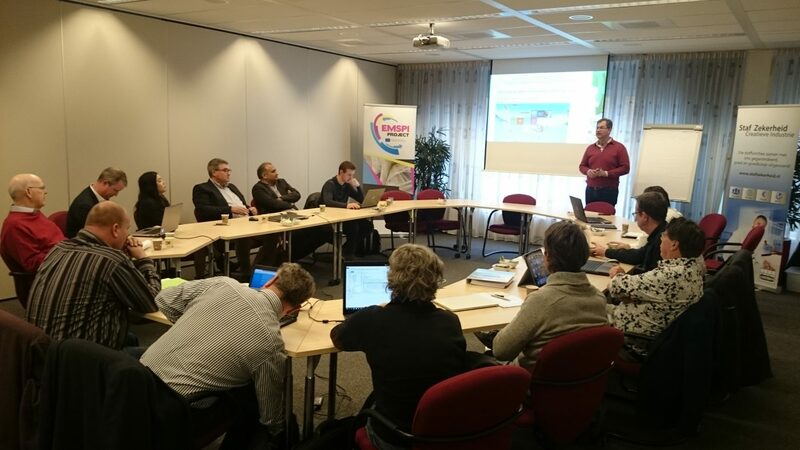 Validation results of the EMSPI project: was the approach of EMSPI successful in The Netherlands? 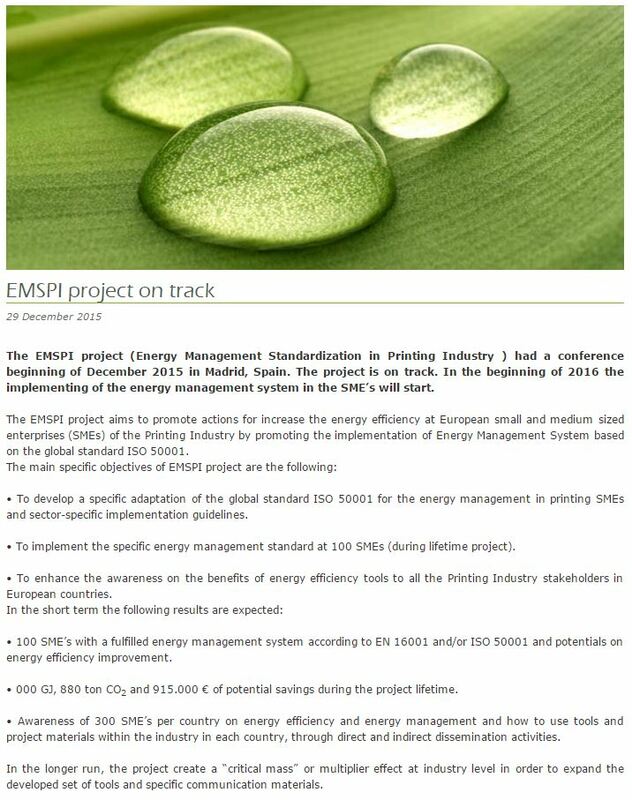 The EMSPI project is an international project about the creation of a tailor made energy management system for the print media industry. The created blueprint materials should be easy to use by entrepreneurs of SME’s. Due to EU legislations and the Dutch government, companies in the print media industry have to make an extra effort to reach the high goals of energy savings and CO2 reduction. Only then we could stop or slow down global warming. This is not an easy task for the SME’s, due to the fact that energy as a compound of their production process is something they don’t see. It‘s not like inks or waste disposals, what is physically/visual on the work floor. To reduce the energy consumption (in almost all cases: electricity) needs a more sophisticated approach, then anticipated for in the first place. 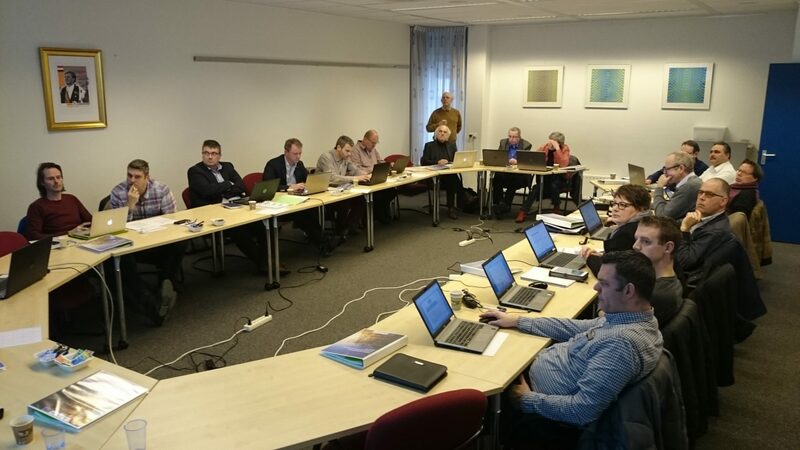 During a period of one year the EMSPI consortium partners worked hard in creating practical blueprint materials the present ones. 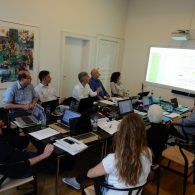 The important question to be answered is: did the EMSPI project results reached the expectations of the main target group: the participating SME’s? Based on these measurements the Dienstencentrum can be optimistic about the effect of the final outcomes. 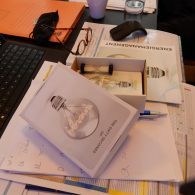 It shows that the quality of the created blueprint materials – combined with the SME coaching – appeared to be a successful formula in The Netherlands. 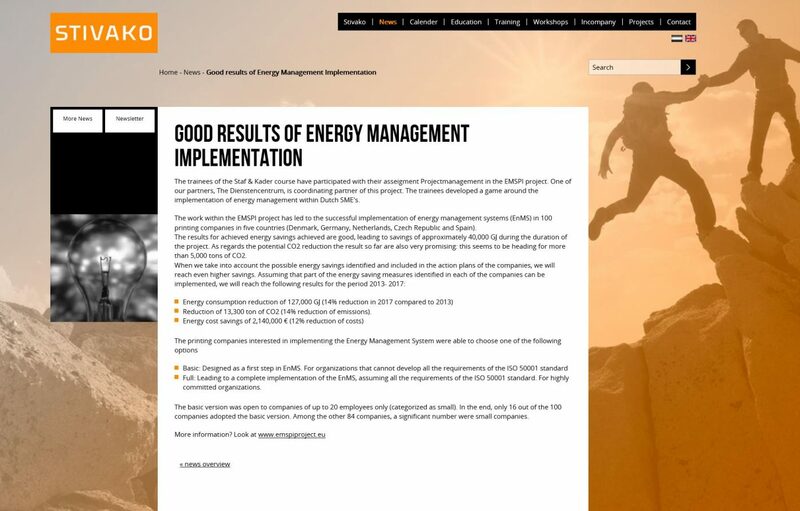 Due to the new legislation on 2017 it will be important for the Dutch SME’s to start soon with the implementation of energy management. 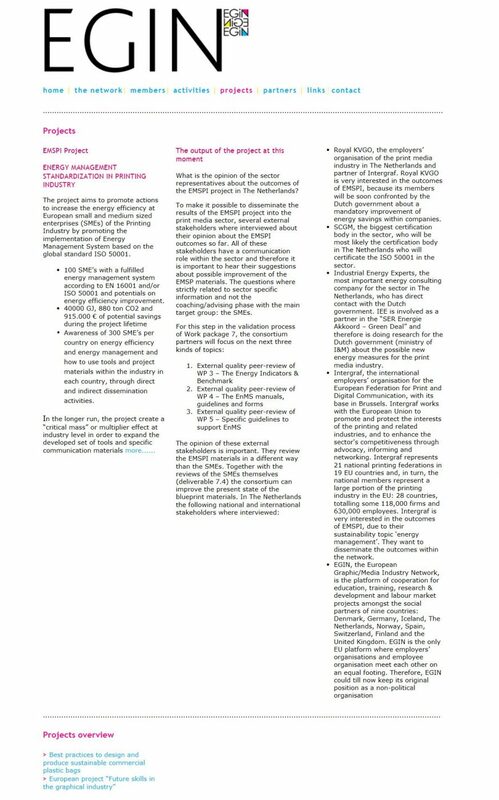 Only with this kind of management approach, an entrepreneur could answer to the strict company controls of 2017. 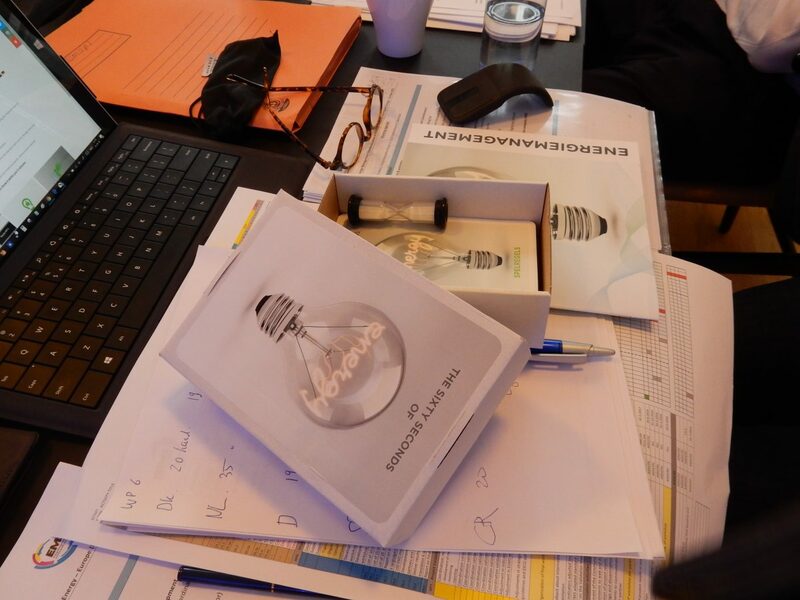 The 20 participating SME’s proved that it is not that complex to implement such a system. 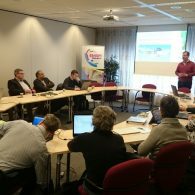 On the annual conference of the European Graphic Media Industry Network (EGIN) at the 21st of April 2016, the EMSPI project was presented. 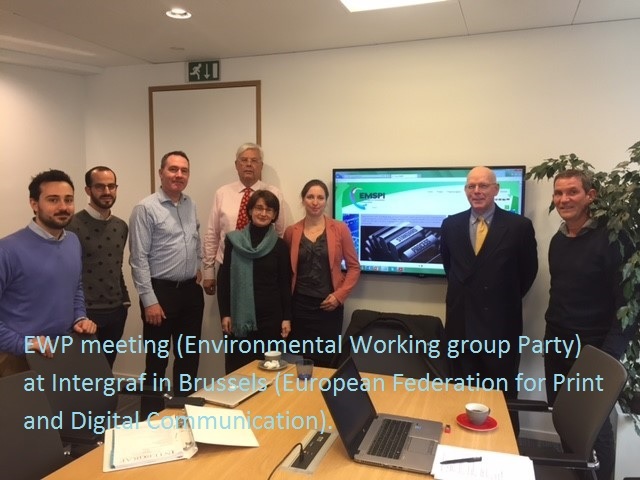 The audience comes from VET institutes, employers en employees organizations, form 11 EU member states. 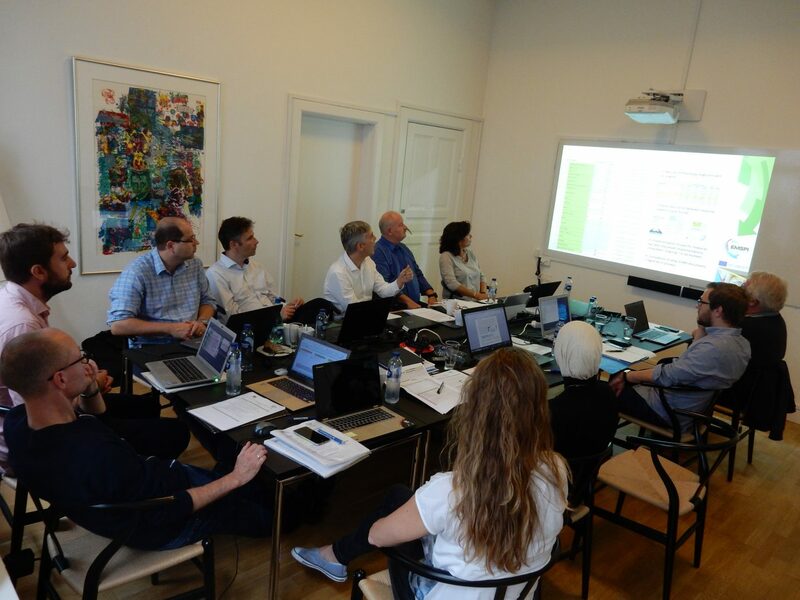 Although, most of the participants are aware of our sustainability problems – the increasing energy consumption and the green house gas effect – most of them, didn’t take action for their own organizations. On the other hand, there where actually institutes who told they really realized some nice initiatives. For instance the changing of the TL lightning into LED. 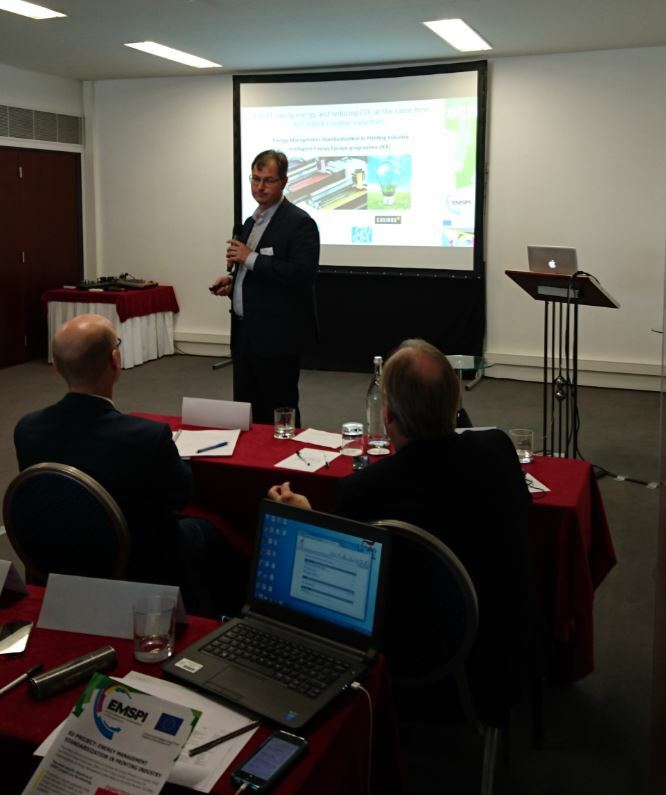 The EMSPI toolbox, created by the partners, with practical blueprint materials, can easily been used by graphic media VET institutes, to empower their own strategy about energy management. Most of the VET institutes have their own graphic arts production lines. Therefor they can use the created content for their own benefit. Let’s hope that more and more companies (SME’s), VET institutes, employer and employee organizations will be inspired to start to put energy saving into the scope of their own strategic policy. 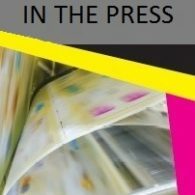 We know there is a big potential for this, due to the fact that the graphic media industry is a part of the creative industry, who wants to take their responsibility towards our environment.